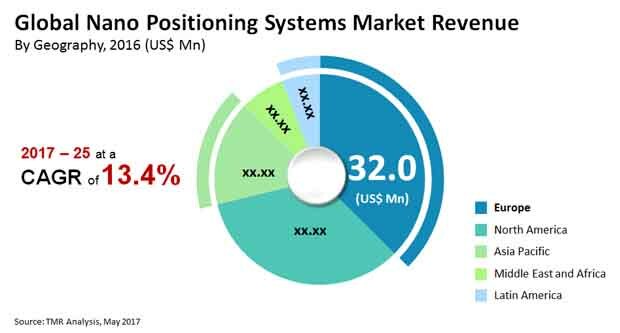 According to a report by Transparency Market Research (TMR), a number of conspicuous players represent just about 75.0% offer in the worldwide market for nano positioning systems, making the business landscape consolidated. Physik Instrumente (PI), Aerotech, Inc., Prior Scientific Instruments, and Cedrat Technologies are the leading players in the market. In 2016, Physik Instrumente held the leading position in this market with a share of 31.1%. Over the coming years, technological advancements are likely to intensify the competition within the market, states the research study. According to the research report, the worldwide nano positioning systems is slated to achieve an opportunity of US$264.1 mn in 2025 from US$85.4 mn in 2016 by ascending at a strong CAGR of 13.40% during the period from 2017 to 2025. Geographically, Asia Pacific, North America, the Middle East and Africa, Europe, and Latin America have emerged as the main regional markets for nano positioning systems across the world. Among these, Europe is leading the global market and this scenario is likely to remain the same over the next few years, states the research report. “The global nano positioning systems market is mainly driven by the increasing demand for MEMS on the basis of capacitive sensors in the consumer electronics and wearables industry,” says a TMR analyst. The rising demand for microscopic structures and devices, which combine the mechanical, optical, and fluidic elements with electronics, which are far more smaller than the grain of a sand and, which offers a very simple structure, providing multiple moving structure being integrated with microelectronics, are the key factors that are expected to fuel the demand for MEMS based capacitive sensors, reflecting positively on the market during the forecast period. Apart from this, the augmenting demand for ceramic technology for miniaturization and the surging need of piezoelectric actuators in aerospace industry are also expected to support the growth of this market in the near future, states the research report.